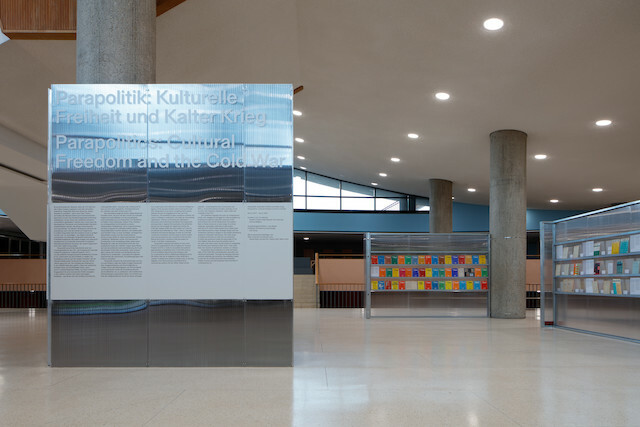 Zak Group has designed the exhibition architecture and graphics for Parapolitics: Cultural Freedom and the Cold War on view at the Haus der Kulturen der Welt from November 3, 2017 until January 8, 2018. The exhibition is curated by Anselm Franke, Nida Ghouse, Paz Guevara, and Antonia Majaca. For Parapolitics we created an intervention that uses varying degrees of transparency to manipulate the viewer's perception. Polycarbonate and acrylic panels fixed to metal stud walls create a blurred environment throughout the HKW’s exhibition halls and foyer. The exhibition presents artworks, archival documents and contemporary contributions that tell the story of the Congress for Cultural Freedom (CCF), an organization founded in postwar West Berlin. The CCF subsidized countless cultural programs until it was revealed in 1967 that the organisation was secretly funded by the CIA. With Parapolitics Zak Group continues in long-standing collaboration with curator Anselm Franke. Previous projects include the Taipei Biennial, After Year Zero and Modern Monsters.